In a large stockpot, heat 4 cups of water; sdd sugar and salt. Stir until dissolved. Add 16 cups cold water, cloves and bay leaves (2 cups of ice can be added to make sure water is cold). Stir to combine. Urwrap turkey; wash the turkey inside and out. Place breast side down in the stockpot with brine; water will just cover the turkey. Refrigerate 18-24 hours. Preheat the oven to 450°F. Take the turkey out of the stock pot; rinse the inside and out with cold water discarding brine. Place the turkey on a roasting rack inside a wide low pan, blotting the turkey with a paper towel. Tuck back the wings and rub the skin of the turkey with the oil. Place a piece of foil just over the breast of the turkey to cover for even roasting. Roast on the lowest rack of the oven for 30 minutes. Reduce oven temperature to 350°F. Pour 1 cup of water into the pan and continue to roast for an additional hour. Remove the foil from the breast and cook another 15-30 minutes. Insert ovenproof meat thermometer so tip is iin thickest part of inside thigh and does not touch bone. Roast until thermometer reads 165°F and drumsticks move easily when lifted or twisted. Let the turkey rest for 20-30 minutes (this is an essential step to allow the juices to redistribute and settle). Serve. - Brining – “a technique whereby meat is soaked in brine which tenderizes, moisturizes and flavors the meat, as well as reduces the cooking time.” (Food Lover’s Companion – Herbst and Herbst) - Brine overnight – at least 18-24 hours; be sure brine completely covers the turkey. - I recommend brining in a 12-quart stockpot or food safe bag that can accommodate the turkey and the brine. 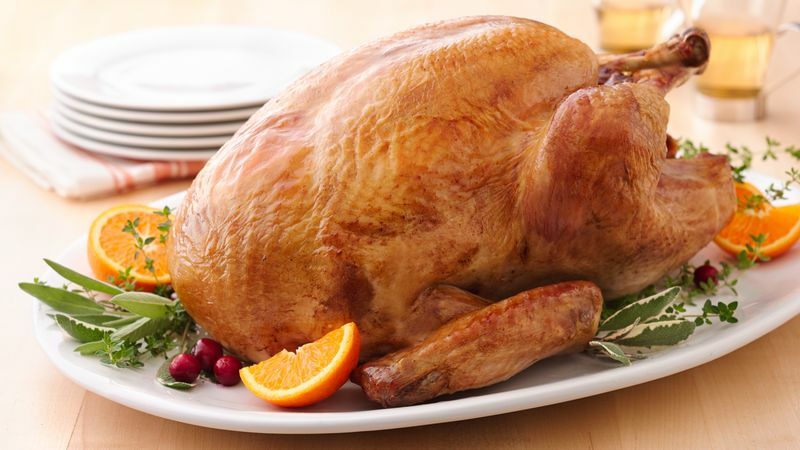 - Turkey – how much should you buy? Allow about 1 pound of uncooked turkey per person. - I recommend trussing the turkey - Truss – “ to secure meat with string, pins or skewers so the food maintains a compact shape during cooking.” (Food Lover’s Companion – Herbst and Herbst) - Bake to internal temperature of 165 degrees – take temperature in thigh of turkey. - Brined meat will have a slightly pink tinge – even though thoroughly baked.